Once you get MakePE where it needs to be, there are several Example CMD files that you can kick off. I recommend Example WinPE 5 x86.cmd. Make sure you Run as Administrator. I’ve spent a great deal of time working on MakePE and writing the scripts, so do me a favor and don’t edit them. They are intentionally generic so anyone should be able to build out WinPE. But if absolutely hijack my work, then have a look in the MakePE\ScriptsRW directory. Keep in mind before you got started, there was only one file in here. 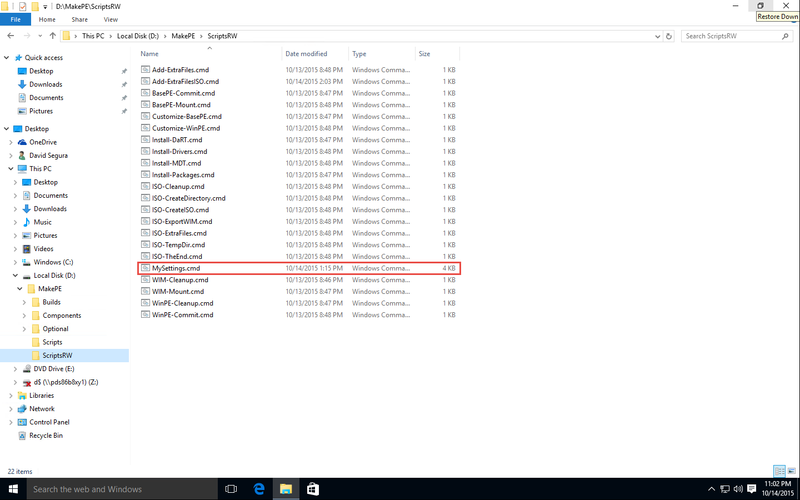 The bad thing about being the WinPE Guy is all the USB Drives I have to keep for different WinPE Versions, Architectures, and builds. I’ve had enough . . . so I decided to spend some time creating SuperPE. But this blog post is about SuperISO right? 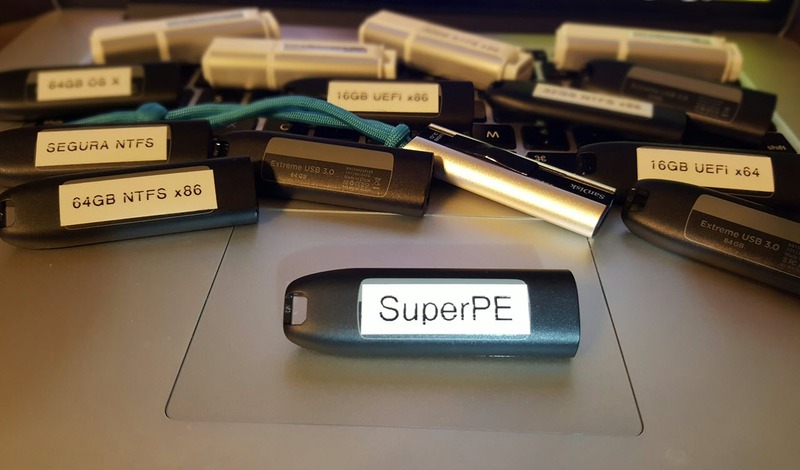 Well it would look SuperBad if I labeled my USB Drive “SuperISO”, but we will get to that soon enough. MakePE comes with several Example Build Script already included. These are in the root of MakePE. The image below contains the Example Build Scripts that I will release first. If you look at some of my other posts on MakePE, they may be named different, so don’t get hung up on what they are called. You should create your own Build Scripts because when I make updates on GitHub to MakePE, I will be updating the Example Build Scripts, but you need to know what to do with them, that is where this post will come in. 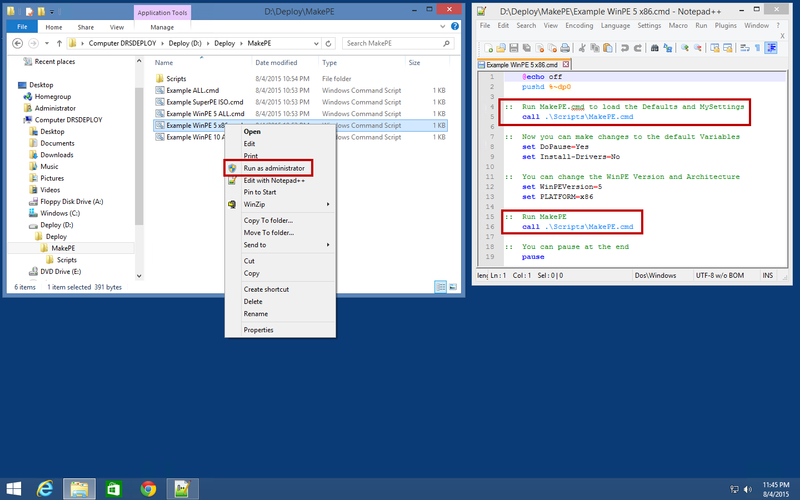 For starters I am going to detail the solo Example Build Scripts, marked above. Each of these Example Build Scripts will build a single WinPE. Since Windows 10 is the hot thing, let’s look at one of these. MakePE supports this too. Just like adding Adding Extra Files to WinPE, the process is the same. 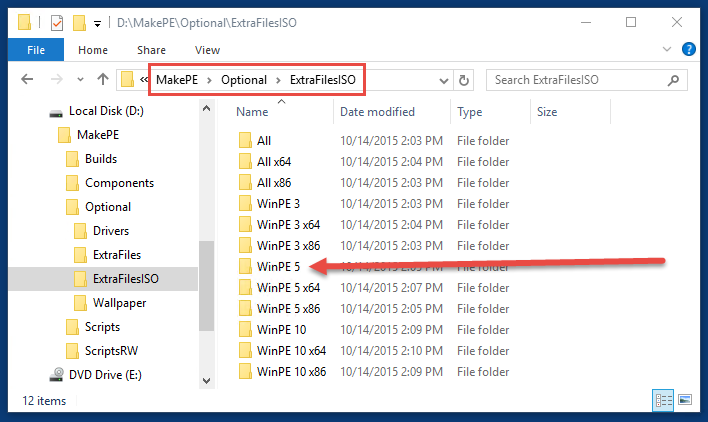 If there are files you need added to all ISO’s that are created with WinPE, just add it to the MakePE\Optional\ExtraFilesISO\All directory. MakePE will handle the rest. You should finally have a good WinPE up to now, and are ready to add Drivers. 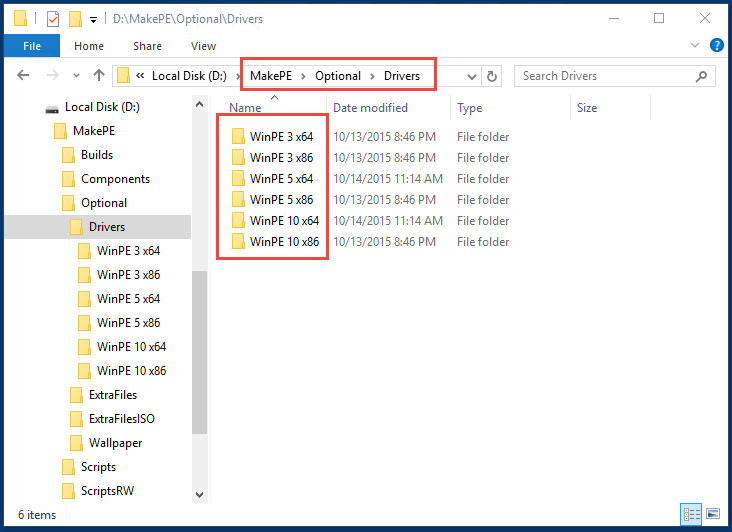 MakePE uses a flat directory for installing Drivers, and these should be created automatically for you. 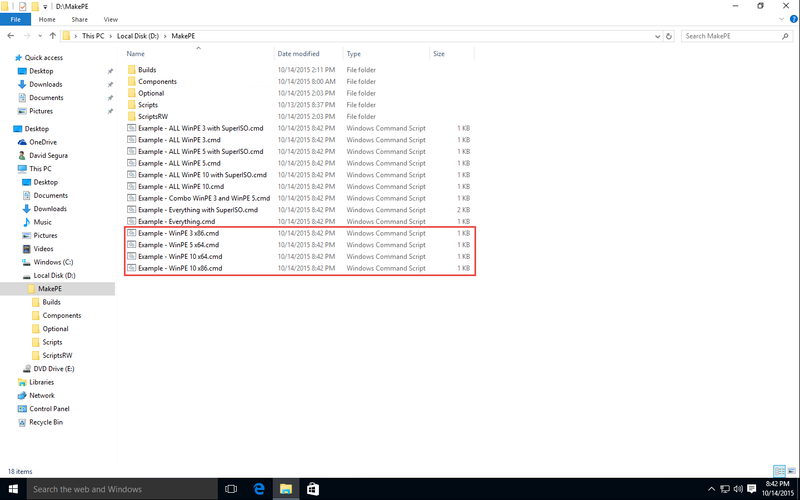 If you look in MakePE\Optional\Drivers, you should see these directories. 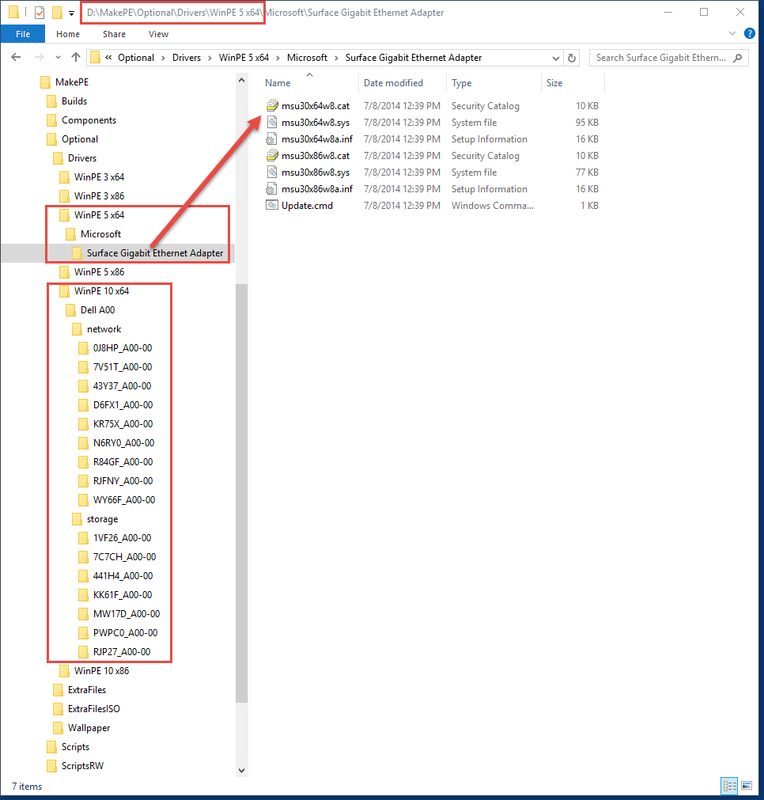 The additional benefit is that I can take these directories and import the complete WinPE Version Architecture directory into SCCM, allowing me to keep the same source for WinPE, WinRE, MDT, and SCCM. You will need to add a Deployment Share to MakePE if you are going to want your Bootstrap.ini or LocationServer.xml. If you are using your Deployment Server with MakePE, then just specify the path in the MakePE\ScriptsRW\MySettings.cmd and you are good to go (I have not tested with spaces in the path). 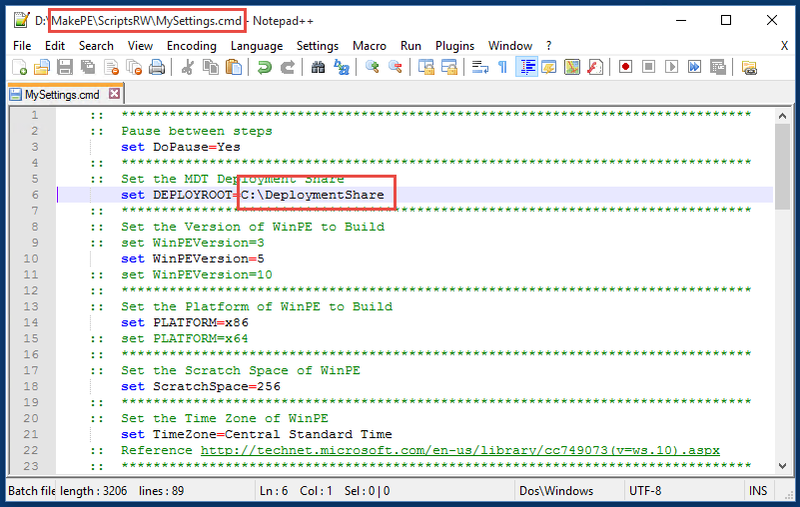 You can even specify a UNC Path (I have not tested with spaces in the path) to a Deployment Share. Additionally, I use MakePE on a clean OS on a Virtual Machine that is not joined to the Domain. This keeps my MakePE Environment clean (from Policy and Agents). To keep the MDT step from throwing an error, I simply add a Net Use command in one of my Build Scripts and I will be prompted for credentials when I kick it off. No need to map a drive letter . . .